Click here to read the story in French. English translation is below. Paul Boultareau. 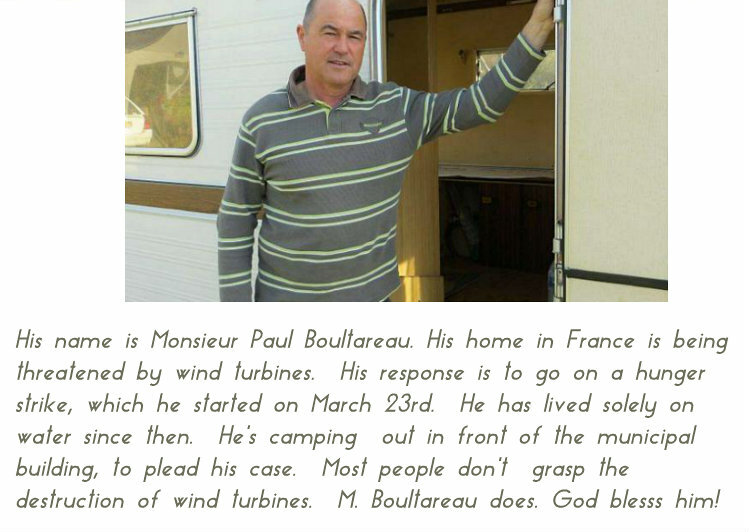 A wind farm is to be built near his home at Grande-Lande, he believes he does not have all the information regarding this construction. Since Monday, he has stopped eating. Paul Boultareau, why this hunger strike? » First, because it is a peaceful action, one to get the attention of government so as to set off a real debate on the merits, if any, of industrial wind turbines. E.g. what is their place in relation to other new energy sources? And what of their impact on the bocage countryside of our district, on health and on wildlife? What are the answers you are looking for? » I would like to understand the financial picture. First, what will be the cost of installing these wind turbines, then their operating costs, and the potential impact on the creation of new jobs in France. I would also like to know how long they will work, what they are to become at the end of the contracts obligating EDF to buy their electricity, and what is their expected output? I would also like to highlight how these contracts will affect the bills of electricity consumers in general and, finally, how these machines will benefit the citizen-consumer. How will you proceed with your campaign? » I had my last meal Sunday night, and since then I have consumed nothing but pure water. Thursday, I will set up my camper van in the village of Vritz, in front of the town hall. I will answer questions from the people who come to see me, and I hope this will lead to a real public debate, one which will present objectively all aspects of the proposal. La Fédération Environnement Durable (FED) regrette cette initiative individuelle. En accord avec son bureau elle demande à Mme Chovet de ne pas mettre en danger sa santé et de s’alimenter à nouveau. He may attempt to do likewise this time around. Catch 22: Hunger strike = health risk (voluntary, peaceful). Wind Turbine Syndrome = health risk (enforced, violent). If the “powers at be”(Gov. agencies, DEP, BOH, etc) really wanted to know how people felt about IWT’S (Industrial Wind Turbines)….don’t you think they should ask the people who are MOST impacted by them?…Like, the folks who are FORCED to LIVE under these ungodly monsters. Don’t you think if they really wanted to know what the effects are from living too close to IWT’S that they would fund some research…or get the info first hand….like…I’ll say this one more time…from the people who are FORCED to live under them…ASK ME…I’m one of them….and I tell you what it’s like …it is HELL!! I have headaches whenever I stay at home and my wife’s ears ring around the clock. It’s like living next to an airport and the planes never land…nor do they ever go away..yes, sometimes it’s a not quite as loud as others ….that’s when the wind hits your house before the Turbines…but…. when it is the other way around and the wind is coming off those Turbines toward you house…look out…Constant and unending bombardment…day and night…I’m about 1/2 mile away from the closest 340′ Turbine ( 1 of 19, called the Hoosac Wind Project) and this is my take on it. Thank You Paul……I hope someone will wake up ! !